It’s no secret the growth of ecommerce is challenging the traditional supply chain. Customers are expecting more when it comes to their ecommerce experience and therefore manufacturers and merchants are demanding more of their service providers. Fulfillment, for example, is no longer a simple pick, pack and ship model. The rise of value-added services, personalization and complexities involved in kitting and customizing products creates more touchpoints and requires more skilled labor. Shipping expectations are extending the work day, which impacts everything from labor costs to utilities. All of this is driving up the cost to do business for everyone involved and leaving many questioning who’s paying for it. In order for a 3rd party provider to offer a true solution, it’s crucial to give them as much information as possible prior to the engagement to ensure clear expectations and scope of work. Often times, unexpected costs and disappointments happen because work wasn’t scoped properly from the beginning. Conversations with a fulfillment provider, for example, should include very detailed expectations of your end-user customer experience. This will help the vendor outline how their distribution network, customer service options, returns options, carrier partners and technology will meet your needs. Clearly defining your expectations upfront so your potential partner has a better understanding of the work needed to live up to those expectations later will limit the number of “surprises” that come up after the ink dries on the contract. It’s funny sometimes how much a business relationship can resemble a marriage. A good marriage doesn’t mean each person likes everything about the other. It just means they like enough that they’re willing to compromise on the things they don’t. If you approach a business relationship with the idea that you’ll find the perfect partner who will meet all of your needs and do things exactly as you want, be prepared for disappointment. Priorities are going to vary somewhere along the way. Start with a list of goals and objectives and rank them in order of importance. Think through your business model, customer service model and what’s most important to you. Focus your efforts on finding a service provider who can deliver on your most important objectives and be willing to compromise on the less important. If you’ve been operating status quo for a while, but you’ve recently decided to make a change within your logistics supply chain as a result of a new ecommerce or DTC strategy, it’s worth taking a fresh look at your entire supply chain first. Examine the bigger picture to see where resources and focus might need to shift or be combined along the chain so that you can add service providers that best fit your growing needs. For instance, if you’re adding ecommerce fulfillment to what historically has been a wholesale business, look for a 3rd party fulfillment provider that can offer a hybrid distribution model. In addition, if your current wholesale model includes pre-packaged bundling at the factory, virtual bundling services at time of fulfillment would be a better option for your ecommerce business. 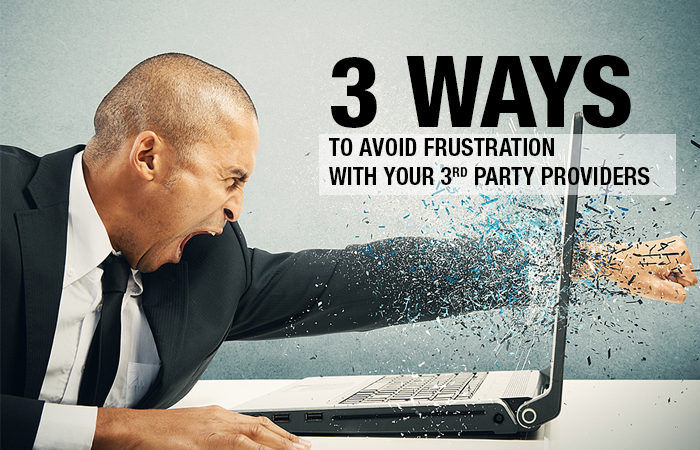 Switching or adding 3rd party service providers is time consuming and can be costly. Put the energy in upfront to avoid disappointment later. Trust me, the last thing your service provider wants is for you to feel misled or disappointed.